Go out People-Watching. You can either eavesdrop on a conversation, draw your own conclusions, and write it up OR observe a stranger or someone you see every day—mail carrier, bank teller, person at the grocery—and decide what you think their life is really like. Write up to 200 words and post it on the Write On! Yahoo or Facebook group Message Board by May 8. Write On! Online is pleased to welcome our newest sponsor: The Write Environment, a DVD series of one-on-one interviews with some of today’s most prolific writers, created and hosted by screenwriter and journalist Jeffrey Berman. 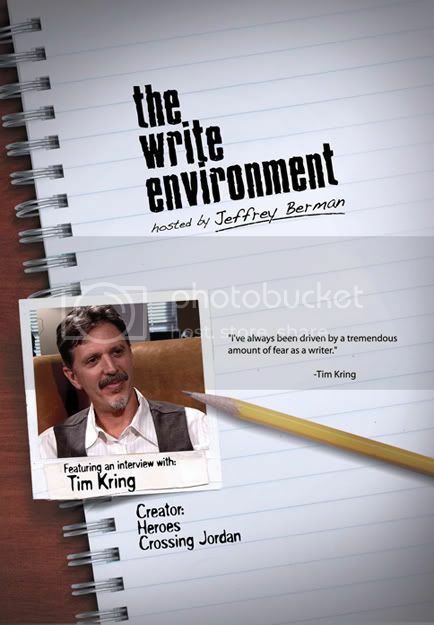 The winner of May Extra Credit will receive The Write Environment: Featuring an Interview with Tim Kring (Heroes creator/executive producer/writer) and have their story in the next newsletter.